Detail view of the canopy. 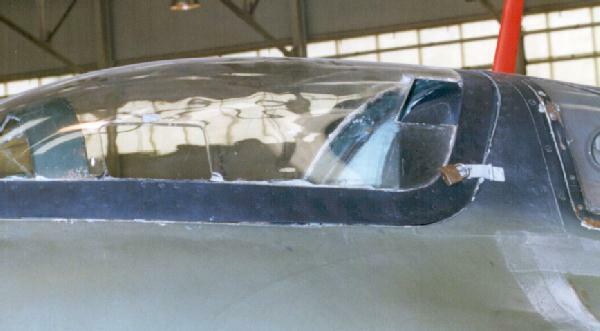 It shows the original ventilation window at the front; the hinged window itself has rotated almost 180 degrees and is hidden behind the canopy frame. The square cut out near the rear edge of the canopy and the padlock are not original. The lower part of the red-painted antenna is also visible. Some of the fabric tape used to attach the wing root panels can be seen in the right-hand corner.